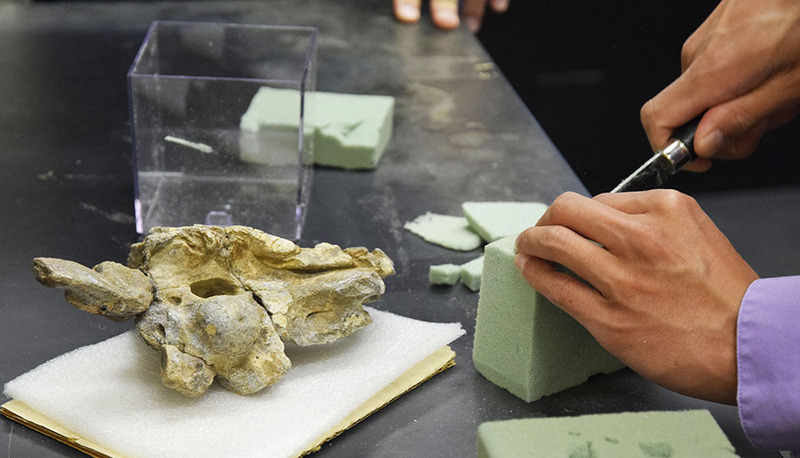 While University of Utah researcher Randall Irmis watches, CEE ​lab manager Sean Yeung (right) prepares a marine crocodilian skull to be scanned. Most people have never held a 150-million-year-old marine crocodilian skull. But if you operate UW CEE’s CT scanner, your odds improve. “There’s always something interesting coming through,” said lab manager Sean Yeung, one of four operators of the largest CT scanner on UW’s campus. Housed in More Hall, the Computed Tomography Facility (CTF) opened for business in January 2016.
scanned. The green foam stabilizes the skull inside the scanner. Discovered in Ethiopia, the 150-million-year-old skull may be a new species of marine crocodilian. 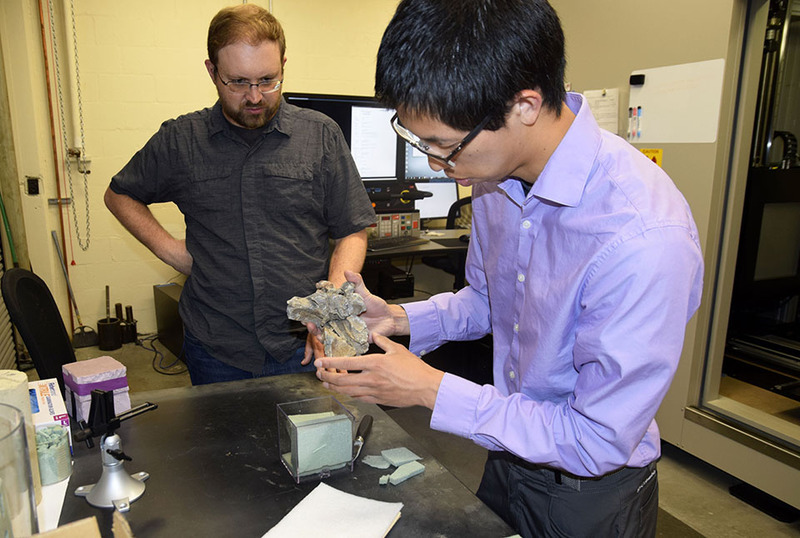 It was scanned as part of a collaborative research project undertaken by Randall Irmis, associate professor of geology & geophysics at the University of Utah, UW Department of Biology associate professor Greg Wilson and Mark Goodwin, assistant director for the University of California Museum of Paleontology. The researchers hope to gain a better understanding of the space between the brain and the inner surface of the skull, called the endocast. 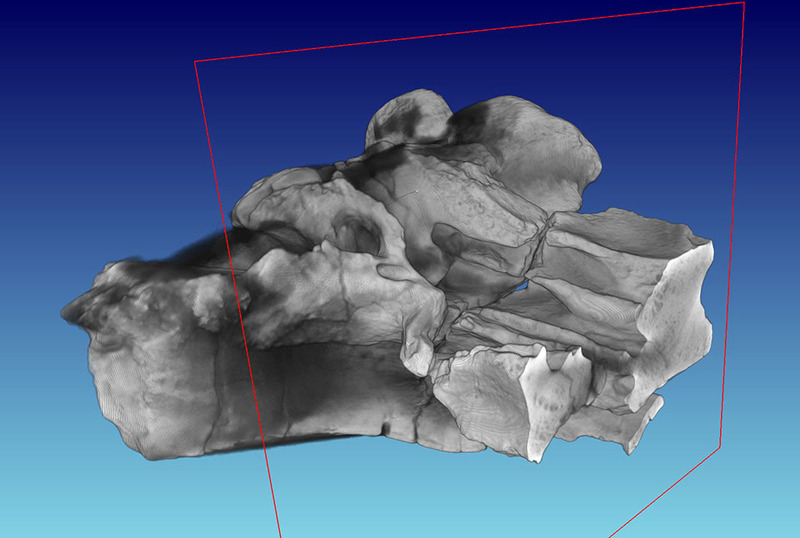 Since the inside of the skull is filled with rock, it requires a powerful scanner to penetrate the dense material, so that enough data can be collected to create a 3D model. Other scanners, such as those used in the medical field, are not powerful enough to scan through the layers of rock embedded in the skull. The reconstructed 3D model can be sliced to reveal the interior of an object. 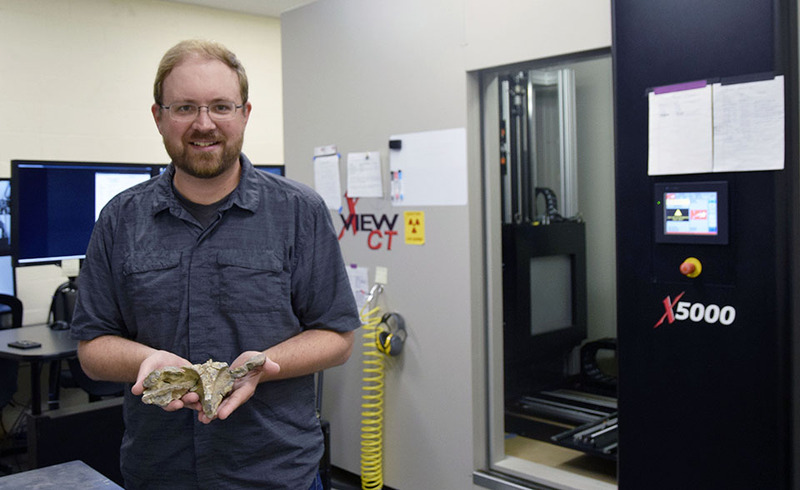 Standing in front of the CT scanner, University of Utah researcher Randall Irmis holds a 150-million-year-old marine crocodilian skull. The CTF is available to other universities, government agencies, private companies and the general scientific community. Scans are performed by trained engineers. Learn more.